Observatorios Observables, is the most recent body of work of Carlos Estévez (Havana,1969), comprised of nine large paintings that depart from the idea of surveillance, navigational instruments and vision from a metaphysical point of view. Estévez is fascinated by the construction of spellbinding objects, painted and perfectly-arranged, that embody their own sense of sculpture, regardless of their function. 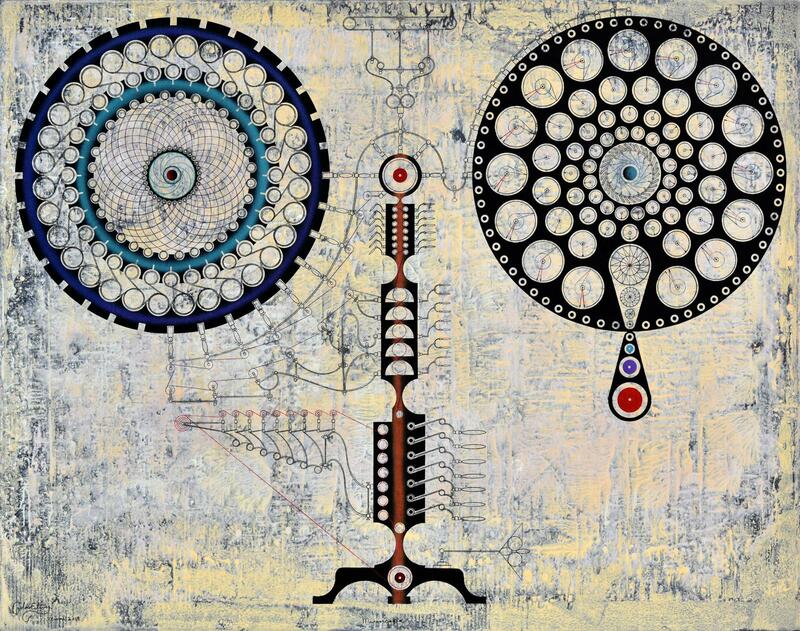 He is inspired by ancient architectural drawings and gear schematics, the inner mechanisms of watches and cosmological charts, resulting in large and detailed technical depictions of imaginary yet complex mechanical devices. Obsessed by our relation to the universe, life and the cycles of nature, he has created his own mapping of apparatuses that function in metaphorical ways. As one observes each painting, comprised of these fantastical objects and what appear to be x-rays of the innards of machines, a metamorphosis occurs: What initially seem to be a compilation of machinery parts, or parts of devices or mechanical drawings are instead something entirely different. Planets become eyes, towers transform into caterpillars, gears bloom into flowers, then astronomical clocks, followed by solar systems, and, finally, pupils that keep watch over us. All these moving drawings of devices suddenly become depictions of all that is natural, yet each represents an entirely abstract world in their own right. Each “tower” is simultaneously a machine, a skeleton of a machine, a map, an animal, a clock. He fuses the human, the mechanical and the natural, along with the unknown, the known and our reality.